General Sir Robert Ford, who has died aged 91, was Commander Land Forces Northern Ireland (CLFNI) on January 30 1972, the day that became known as Bloody Sunday, in which 13 people lost their lives. 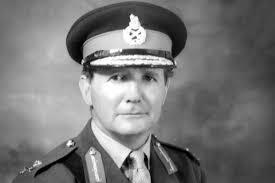 Ford succeeded Major-General (later General Sir) Anthony Farrar-Hockley as CLFNI in July 1971. Violence had already been mounting when, a month later, internment without trial was introduced for suspected IRA men. Even moderate nationalists withdrew their co-operation and a widespread campaign of civil disobedience began. In Derry, by the end of the year, barricades were in place to block access, many of them impassable even to the British Army’s armoured vehicles. The fatal shootings on Bloody Sunday led to an upsurge in bombings in Londonderry and a sharp deterioration in relations between the Army and the Catholic minority. In the course of that year the Provisional IRA killed or wounded about 600 soldiers and carried out more than 1,000 bombings. When the Ulster Defence Association, the largest loyalist paramilitary organisation, retaliated, Ford took a firm line in dealing with the Protestant extremists. In one incident, when the UDA attempted to attack the homes of Catholics, he did not hesitate to inform their leaders that he would give the Army permission to fire if they did not back down. In July 1972 “Operation Motorman” put an end to the “no go” areas in Belfast and Derry with the removal of the barricades. The Saville Inquiry into the events on Bloody Sunday was established in 1998 and the Report was published in 2010. Ford gave evidence to the tribunal and, in the Report, it was stated that there was no evidence to suggest that he had contemplated using lethal force against unarmed rioters who were not posing a threat of causing death or serious injury. In a confidential memorandum, written three weeks before Bloody Sunday, and sent to his superior officer, Lieutenant-General Sir Harry Tuzo, Ford stated that he was coming to the conclusion that the minimum force necessary to restore law and order was to shoot selected ringleaders among the “Derry Young Hooligans”. He suggested that the ammunition in standard rifles was too powerful and that rifles converted to .22 bullets would enable soldiers to engage ringleaders. Under cross-examination at the Inquiry, he said that he envisaged the weapon being used to incapacitate and cause fewer casualties. Civil rights activists expressed disappointment, however, that the Report had failed to hold Ford accountable as the commander who bore the overall responsibility in that he had ordered the paratroopers, a unit which, arguably, was unsuited to civilian policing operations, into Derry. Robert Cyril Ford was born at Yealmpton, Devon, on December 29 1923 and educated at Musgrave’s College, Gateshead. He attended the Royal Armoured Corps Octu at Sandhurst and was commissioned into the 4th/7th Royal Dragoon Guards (4/7 RDG) in June 1943. He took part in the D-Day landings in June 1944 and in operations throughout the North West Europe Campaign and was mentioned in despatches. He subsequently served with his regiment in Egypt, Palestine and Trans-Jordan. Attendance at Staff College, Camberley, was followed by a staff job at the War Office and then a return to 4/7 RDG. In 1960, he was posted to 20th Armoured Brigade as brigade major and, in 1964, he moved to the MOD as GSO1 on the staff of Admiral of the Fleet Earl Mountbatten, Chief of the Defence Staff. Ford took command of 4/7 RDG in 1966 and commanded 7th Armoured Brigade two years later. At the end of his tour as CLFNI, he became Commandant of the RMA Sandhurst. During this appointment, he extended the Commissioning Course. He returned to the MOD in 1976 on becoming Military Secretary. His final appointment was that of Adjutant General with responsibility for developing the Army’s policies on personnel. He retired from the Army in 1981 in the rank of general. Ford was Governor of the Royal Hospital Chelsea from 1981 to 1987 and chairman of the Army Benevolent Fund for the same period. He was ADC General to the Queen from 1980 to 1981; Colonel Commandant RAC from 1980 to 1982; Colonel Commandant SAS Regiment from 1980 to 1985; Colonel 4/7 RDG from 1984 to 1988. He was vice-chairman of the Commonwealth War Graves Commission from 1989 to 1993. He was appointed MBE in 1958 and advanced to CBE in 1971, knighted in 1977 and appointed GCB in 1981. In retirement, he enjoyed watching cricket, playing tennis and the theatre. Robert Ford married, first, in 1949, Jean Claudia Pendlebury. She predeceased him. He married secondly, in 2003, Caroline Margaret Peerless (née Leather); she also predeceased him. He is survived by his son from the first marriage.